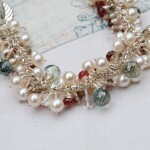 Handmade white round freshwater pearl and mixed gemstone cluster bracelet - This beautiful and delicate bracelet is brimming with an enviable selection of the most exquisite and enticing white round pearls, forest green mystic quartz faceted onion briolettes, Rubillte Garnet faceted onion briolettes, Smoky quartz faceted rondelles and crystal quartz faceted rondelles. 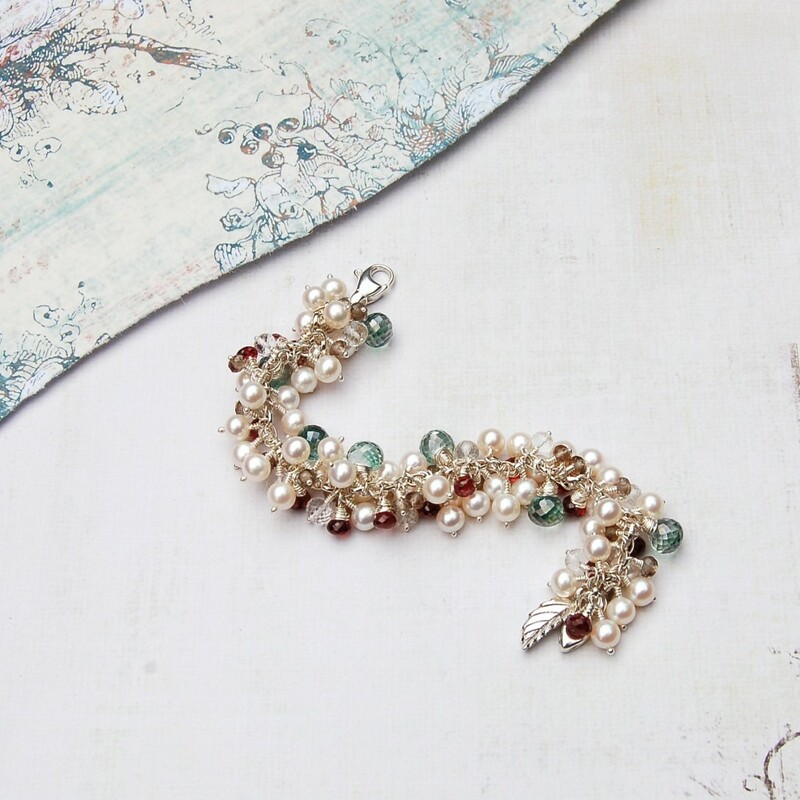 This bracelet is romantically elegant and delightfully feminine and awash with exquisite gems and pearls. 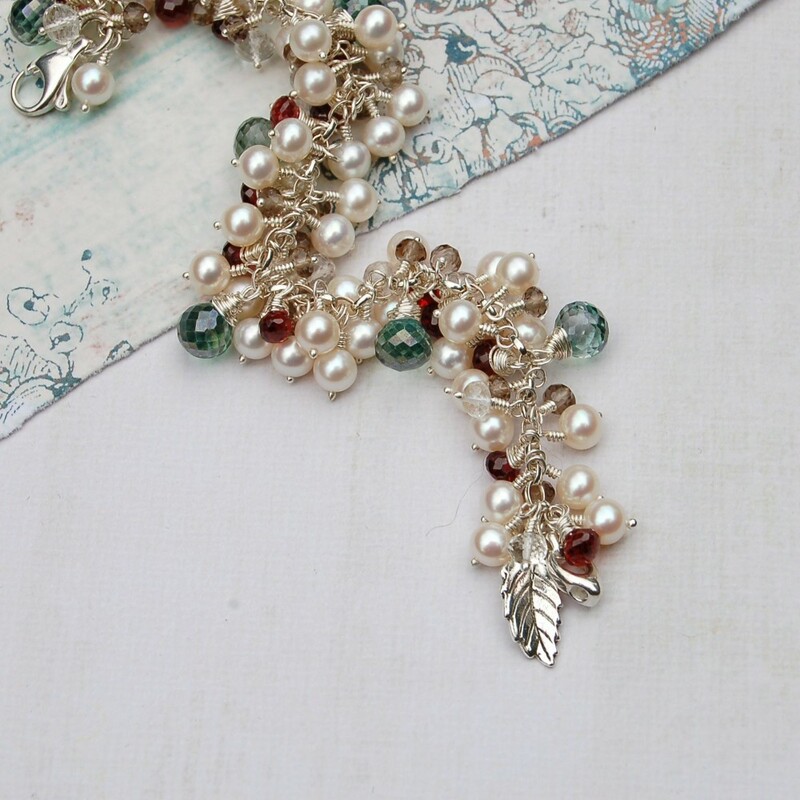 Each pearl & gemstone has been meticulously wired to each of the links of the chain upon handmade fine silver and sterling silver head-pins and wire. The round white freshwater pearls are 5.5-6mm to give it a fantastic stylish look. 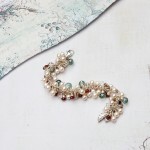 The forest green mystic quartz measure 7.5 -8mm and are interspersed along the bracelet which makes it glow and also gives a beautiful contrast to the pearls. The rubillte garnet measure 4.5 – 6.5mm and are a fantastic deep red wine colour and are also interspersed along the chain. 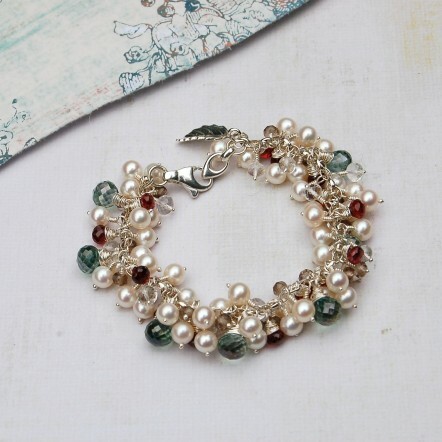 This bracelet is very eye catching with its contrasting colours without being over powering and has a warm and glowing look about it.The bracelet is fastened with a gorgeous sterling silver lobster clasp with a lovely sterling silver leaf charm. 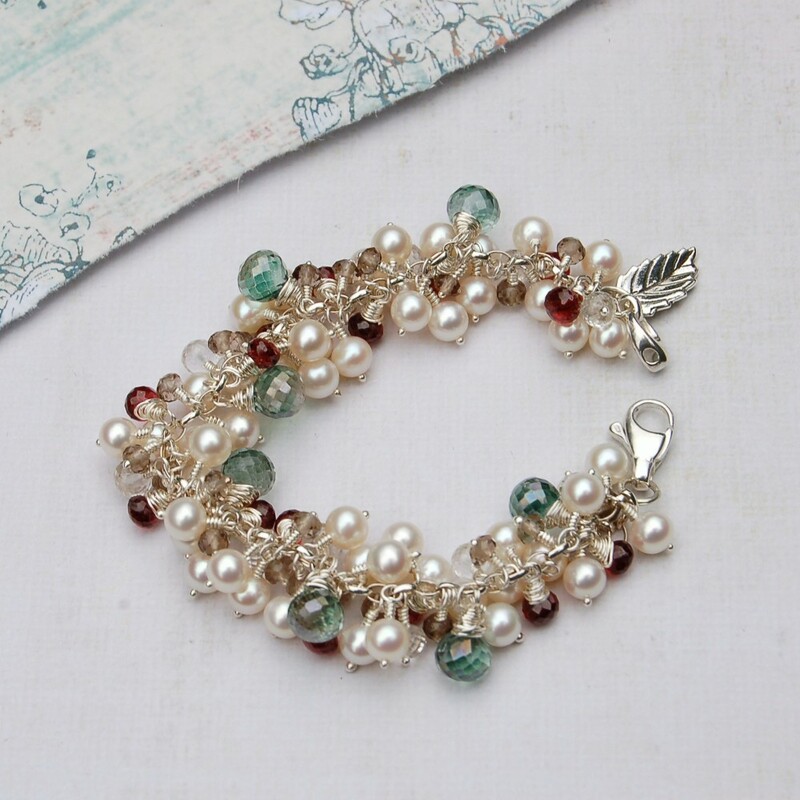 Handmade white round freshwater pearl and mixed gemstone cluster bracelet – This piece is so utterly divine and luxurious, all wrapped up with truly captivating and sumptuous gems & pearls, this bracelet will make a fabulous addition to your jewellery collection or make a treasured gift for someone special. All gems and pearls on this handmade bracelet are AA – AAA quality and all metals are sterling or fine silver. 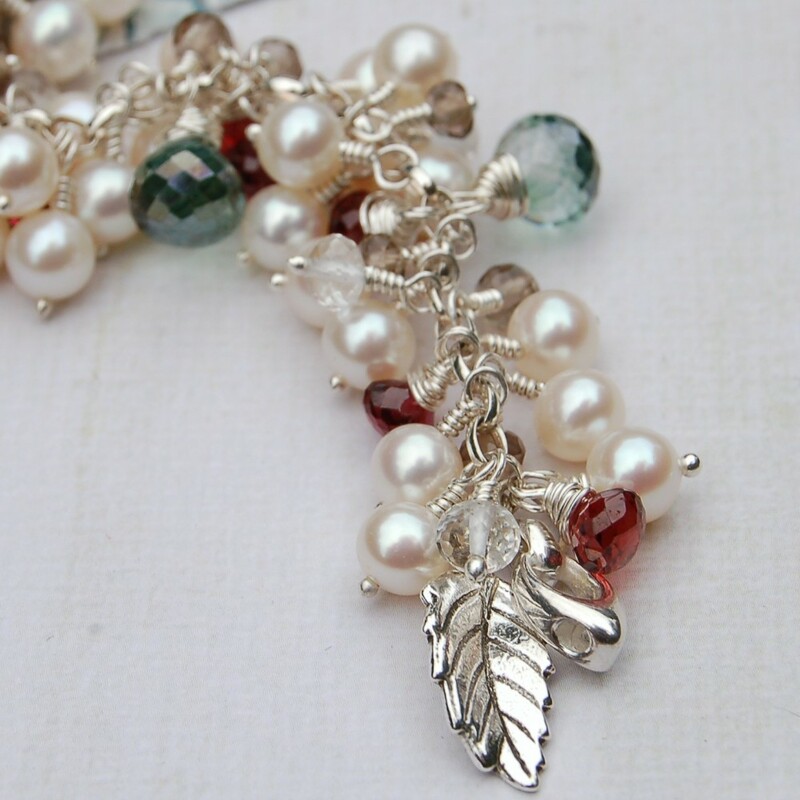 IndiviJewels designs and makes all its own jewellery from our workshop so if you would like something a little different then please just contact us and we will see what we can do for you.